Shaolin kung fu is a type of martial arts associated with the Shaolin monasteries in China. The philosophy of Shaolin is a combination of Taoism and Buddhism. Meditation is an essential part of the Shaolin martial art practice, allowing you to banish negative thoughts and gain strength from your mind. According to legend, an Indian priest named Bodhidharma introduced the Shaolin monks to meditation. In order to prevent the monks' muscles from becoming atrophied, Bodhidharma instructed the monks to do a series of calisthenics that eventually developed into kung fu. Prepare for Shaolin meditation. Find a quiet room in your house and turn off any distractions such as the phone or TV. Sit on the floor in a crossed-leg or lotus position. Keep your back straight. You want to be comfortable while meditating so you might want to place a cushion under your buttocks. Close your eyes. Begin the Shaolin meditation by focusing on your breath. Breathe deeply with your stomach for a few minutes while you attempt to clear your mind. Your stomach should expand when you are breathing in and contract while breathing out. Visualize negative energy being released as you breathe out. In Shaolin kung fu, you need to keep your emotions under control. Refocus your mind by concentrating on your breathing when your thoughts wander. Count as you breathe in, and count as your breathe out. Continue to count your breaths until you reach 10. After you reach 10, count backward to one. If your thoughts stray, start the count again. 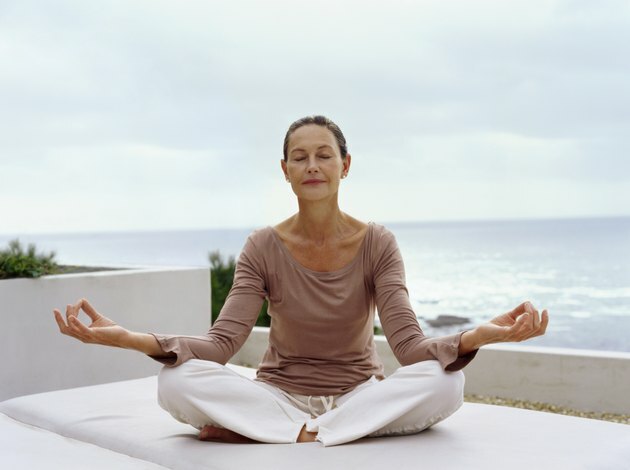 Practice your meditation for 30 minutes before and after you train for martial arts. Meditation helps to calm and focus the mind, necessary skills for martial arts. Add meditation sessions as needed. Some Shaolin kung fu masters meditate before going to sleep at night. You can also meditate at other times throughout the day when you are feeling frustrated or stressed. Be patient when learning to meditate. It will take many sessions before you are able to control your thoughts.